The Cork Mother Jones Committee has received commemorative scrolls from a number of trade union groups from the United States which collectively represent many millions of American workers. The proclamations express gratituted and appreciation of Cork born Mary Harris Jones (a.k.a. “Mother Jones”) and her pioneering work on behalf of U.S. and migrant workers in the latter half of the 19th and early 20th century and also express thanks to the City of Cork and the Cork Mother Jones Committee for hosting the festival and summer school in her honour. The proclamation from the American Federation of Labor – Congress of Industrial Organisations (AFL-CIO), the largest federation of trade unions in the United States, and its affiliates, representing in excess of 12.5 million U.S. workers, states: “On behalf of the 12.5 million members and 55 affiliates of the AFL-CIO, we are proud to support the Cork Mother Jones Festival. America is a nation built by immigrants like Mother Jones whose Spirit lit a flame in our hearts”. 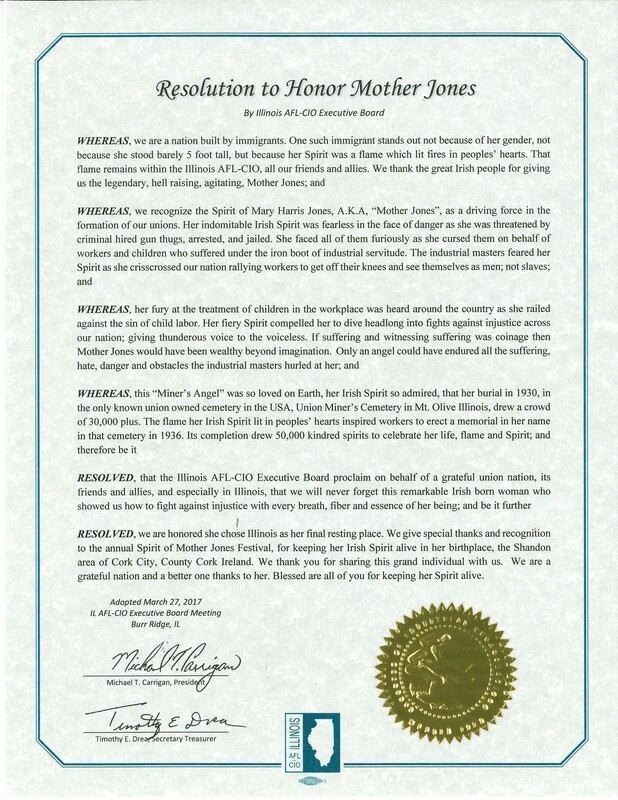 A second proclamation, from the Illinois AFL-CIO Board, “We are honored she (Mother Jones) chose Illinois as her final resting place. We give special thanks and recognition to the annual Spirit of Mother Jones Festival, for keeping her Irish Spirit alive in her birthplace, the Shandon area of Cork City, County Cork, Ireland. We thank you for sharing this grand individual with us. We are a grateful nation and a better one thanks to her. Blessed are all of you for keeping her spirit alive”. The third proclamation is from the United Mineworkers of America, a union that Mother Jones had a close association with during her life. 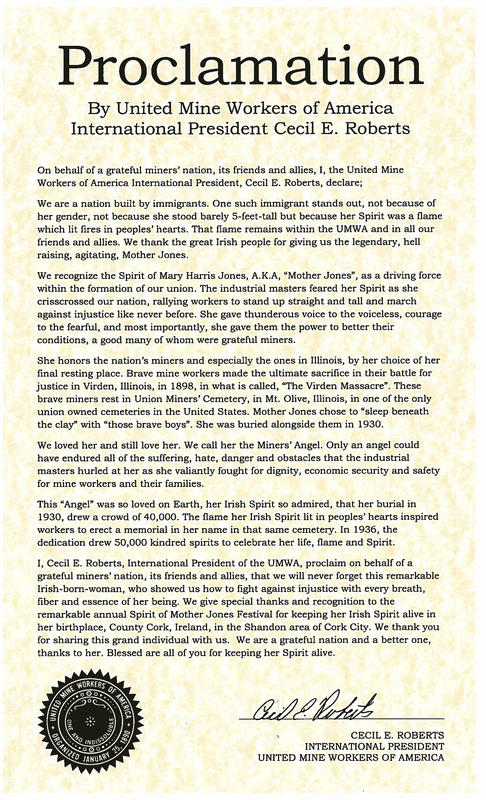 It includes a personal word from the union’s International President, Mr. Cecil E. Roberts: “I, Cecil E. Roberts, International President of the UMWA, proclaim on behalf of a grateful miners’ nation, its friends and allies, that we will never forget this remarkable Irish-born woman, who showed us how to fight against injustice with every breath, fiber and essence of her being. We give special thanks and recognition to the remarkable annual Spirit of Mother Jones Festival for keeping her Irish Spirit alive in her birthplace, County Cork, Ireland, in the Shandon area of Cork City”. 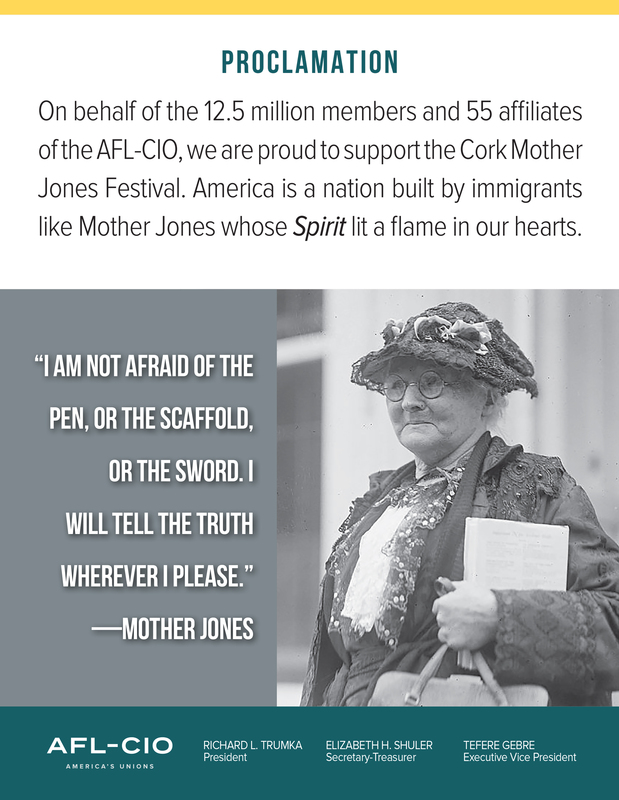 The Spirit of Mother Jones Festival is the only festival held in the homeland of an immigrant who came to the USA and became a giant in the labor movement. The proclamations were well deserved!